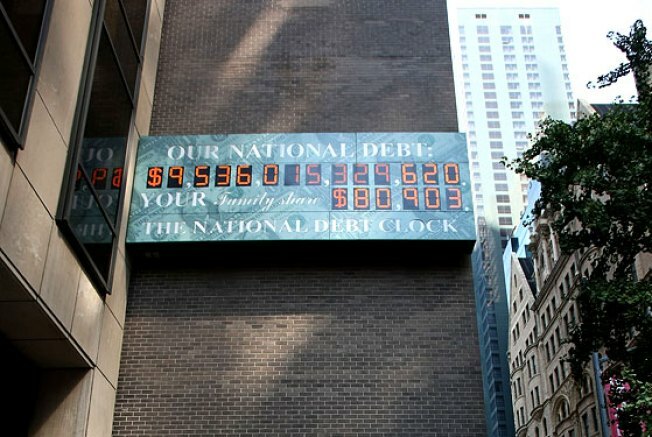 Ha, we totally forgot about the giant national-debt clock in Times Square, which was put up by real-estate developer Seymour Durst in 1989 to call attention to what was then a $2.7 trillion deficit. Seymour died in 1995, but he is surely rolling over in his grave now that the debt has reached over $10 trillion and the clock has officially run out of digits. Currently, they're using the dollar sign as a stopgap, but Durst's son Douglas has commissioned a new clock with two extra digits in anticipation of the U.S. digging itself a deeper hole. Durst the Younger was oddly prescient about this state of affairs in 2000, when the clock was taken in for repairs. "We'll have it ready in case things start turning around — which I'm sure they will," he told CNN at the time. "The politicians will do what they have always done and start spending more than we can afford."